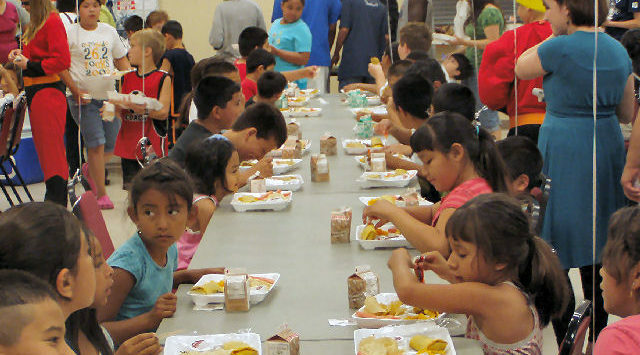 The free summer lunch program in Salina begins this week. The free summer meal program, provided by Salina USD 305, begins today and goes through Friday, July 17th. According to USD 305, all locations will serve a free summer lunch from 12-12:30 p.m. No meals will be served on Friday, July 3. Breakfast will be served only at the Sunset and South High School sites from 7:45-8:15 a.m. June 1 through July 2 at Sunset and July 10 at South High School. The annual ribbon-cutting event and Summer Meal Program kickoff will be Thursday, May 28 at 11:55 a.m. at South High School. During the 2014 summer program, 3951 breakfasts and 25,145 lunches were served to Salina children at eight open sites and one enrolled site. Coalition partners are USD 305, Heartland Programs, United Way, Church of the Cross, The Salvation Army, Sunrise Presbyterian Church, and The Volunteer Connection. The free lunches are for all children ages one through eighteen. Adults are welcome to eat for $3.60. Breakfast price for adults is $2.00. There is no fee or registration required to receive meals. This program is an equal opportunity provider.